Deb's Cup of Tea: I Won't Be Saying, "Thank You." If you've been with me since this blog began, and I realize I've been blogging for 5 years now, you are aware that, in October of 2009, 5th 3rd bank botched a major deposit which sent my finances into a tailspin. I lived off the kindness of friends for years and have, only this year, seen a glimmer of light at the end of a very long and very dark tunnel. I think, at times, I could be forgiven for thinking life was completely against me, that every time I thought I saw that glimmer of light, it turned out to be the reflection of the eyes of yet another of life's rats, there to gnaw on what little hope I had amassed. It is this reality, more than anything else, that caused me to make a conscious choice to, last year, embrace gratitude in whatever form it took, from sunlight in the morning to dinner with a friend to an unexpected Target gift card. I truly believe forcing myself to change my approach and outlook on life has eased my stress level. Pam and Patt remind me, sometimes with every conversation, of how far I have come and how deep was the hole into which I fell. The recent car problems at the end of April would have been far, far more of an issue had they happened 3 years ago. I would probably be out of a job because I need a car to do my job and I wouldn't have had the funds to repair it 3 years ago. I felt snakebit, to be sure, but I could handle the stress and get back on my feet much faster now than I ever could have post-2009. My mechanic informed me I needed four new tires. The travel for work that I had to do would pay for those until that had to go for car repairs. (sigh) I can save. I have trained myself to do it. I could buy 2 this month and then 2 next month. I think of my savings as my "water heater fund". If I have enough saved to pay cash for a new water heater, I am good. I changed "water heater" to "Jeep tires", but the idea was still the same. In the middle of the month, I received quite a surprise from 5th 3rd. Without any word, I received a check from them. There was no note or memo or cover letter, just a line that said, "Send check to customer." Now, I have not been a customer of theirs since June of 2010 and I wouldn't recommend them under any circumstances, so this line caused me some puzzlement. I also refuse to talk to them anymore because the person I call never knows what anyone before him or her has said to me and I get promised things they never deliver. So, I was not about to call them and inquire after the reason I received this money. I delved back into my folder of 5th 3rd's misdeeds and, to the penny, the check was exactly how much money they charged me in overdraft fees and which they removed from my savings account when they were told not to touch my savings at the time of the check deposit problem; to the penny. Is this an admission that they were wrong? I'm still waiting for an apology and I probably shouldn't hold my breath for one. Institutions such as these never admit wrong doing, even if someone, like me, has the paperwork to prove they were wrong. I deposited the check and waited for it to bounce. It didn't. I saved 30% of it and then used part of it to pay off some bills, like the bills for my physical therapy. 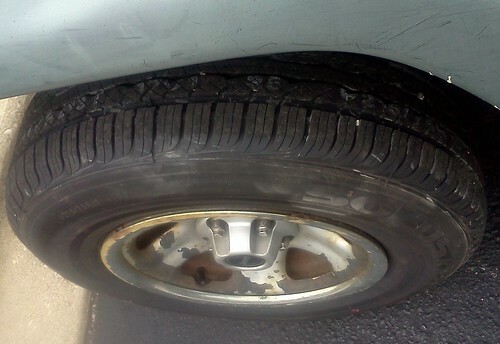 The big thing was that now I could get new tires, four of them. The difference in the drive and the ride is palpable. I don't remember when I bought the four which were replaced. They provided me with great wear and I certainly got my money's worth from them. So, this unexpected infusion of cash was extremely welcome. I can look at taking a vacation this summer to visit Carole in Virginia. While I am grateful for this, I won't be saying, "Thank you" to 5th 3rd, however. Maybe things would have fallen apart anyway. I discovered that I wasn't doing some financial things right, but the effect would have been less of a catastrophe than it was because they screwed up. I still can't say for sure that I see the end of the tunnel, but I have 4 new tires on the Jeep to move forward toward that light.